The Chinese Communist Party has sought to attack Shen Yun Performing Arts, the premier classical Chinese dance and music company, since its inception. Run by overseas Chinese, the New York-based Shen Yun remains firmly independent of the Chinese regime and tours the world, performing in about 20 countries and 100 cities. Tactics used to try to shut down the company are believed to include tire slashings, threats to theaters, and diplomatic interference. Now, the Western media is being pressed into the task. 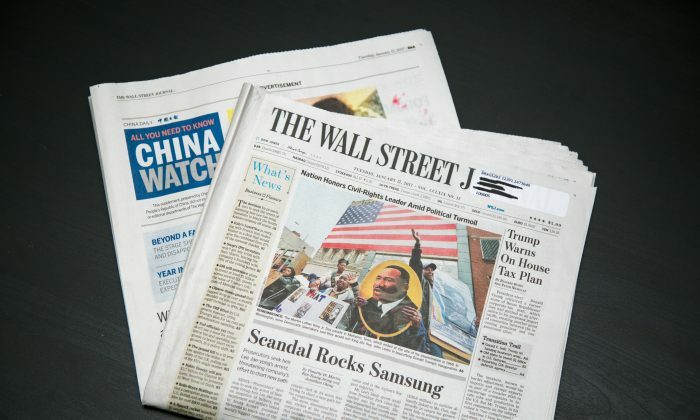 Readers of the Jan. 17 print edition of the Wall Street Journal (WSJ) received a supplement produced by China Daily, a state-run media known for carrying the ideological line of the Chinese Communist Party. The pages of the supplement are marked “paid advertisement” in the header. The Age, a broadsheet newspaper in Australia, carried similar content on Jan. 13. Readers who flipped to page 2 of the supplement found a commentary piece on Shen Yun. The company states on its website that its mission is to use the language of music and dance to “bring back” China’s divinely inspired culture, telling the tales of ancient and modern China that embody it. Readers of the supplement in WSJ weren’t apprised of the company’s mission, however. Instead, in inflammatory tones, the piece attacked Shen Yun because its dancers practice Falun Gong, a traditional Chinese spiritual discipline. Given that Shen Yun is currently on its annual world tour, the commentary piece was likely intended to turn potential Shen Yun theatergoers away from the performances by denouncing the company as a hidden vehicle for Falun Gong, and to slander Falun Gong in the process. Chinese authorities are believed to have employed a range of other, less savory, tactics to achieve the same end. Leeshai Lemish, an emcee with Shen Yun, keeps a running log of incidents, which include unusual and targeted tire slashings of Shen Yun vehicles, odd calls to theaters, letters from Chinese diplomatic representatives making veiled threats to force elected representatives not to attend Shen Yun, and more. Falun Gong, or Falun Dafa, is a traditional Chinese spiritual discipline that involves physical exercises and teachings based on the principles of truthfulness, compassion, and tolerance. After the practice spread rapidly through China by word of mouth for seven years, the Chinese regime began violently persecuting Falun Gong practitioners in 1999; the campaign of persecution has been accompanied by propaganda inciting hatred—and this sometimes spills over into the West. The China Daily “exposé” of Shen Yun, if it was truly intended as such, amounts to a clumsy attempt at propaganda. Shen Yun states on its official website that the company “was established by Falun Dafa practitioners in 2006.” Official Shen Yun program books state that certain acts or vignettes depict the Chinese regime’s persecution of Falun Gong. Regional Falun Dafa associations are commonly presenters of Shen Yun in different locales and are identified as such in Shen Yun promotional materials. The claim that Shen Yun “demonizes the Chinese government” attempts to turn the abuser into the victim. Shen Yun’s current program includes, for instance, a depiction of Buddhist monks cleverly resisting persecution by Communist Party elements in one vignette, and of Falun Gong practitioners peacefully defending their faith in another—all stories drawn from real political campaigns that have taken place in China. One could say more credibly that the Chinese regime has demonized itself, by committing violence against its own peaceful citizens. The countless horrors associated with the Cultural Revolution, other political campaigns, and the persecution of Falun Gong practitioners are well-established realities. And Shen Yun’s dance vignettes are much more about the courage and heroism of spiritually grounded people overcoming incredible odds than about the Communist Party’s own violent pathologies. The Chinese regime’s claim to be the arbiter of what is genuine traditional Chinese culture or what qualifies as a “blasphemy that masquerades as art” (the title of the commentary article) is bizarre to say the least, and highly ironic. Mao Zedong, the founding revolutionary and Party leader, oversaw a decade-long campaign in the Cultural Revolution (1966–1976) for the express purpose of destroying China’s traditional culture and promoting atheistic communism. The calls to boycott Shen Yun mentioned in the article have only ever been issued directly from the Chinese regime itself. And sometimes they have an effect opposite to that intended, as when politicians in Western countries who receive a letter from the Chinese consulate condemning Shen Yun then become interested in seeing it for themselves to learn what all the fuss is about. Epoch Times has run special coverage of audience reactions to Shen Yun performances since the company’s beginning in 2006 and has reported regularly on attempts to harm the company (and those attempts are often predictable failures). Perhaps the larger question is not that China Daily is publishing crude propaganda from the Communist Party, but that WSJ is comfortable with carrying such material. Though the newspaper provided a standard disclaimer that the material in question “did not involve the news or editorial departments,” the publication cannot be absolved from responsibility for what it prints. Shouldn’t the editorial management of the venerable financial newspaper be wary of carrying material that seeks to perpetuate marginalization, exclusion, and hatred of a vulnerable group that is violently persecuted in China to this day? The Chinese Communist Party will certainly do its best to continue its persecution campaigns beyond its borders. It is up to the free media of the West to take a principled stance—even if that means less advertising revenue—on whether or not to allow such naked propaganda in their own pages.